This hip southern mountain town is the perfect place to spend a weekend away from Clemson. There’s plenty of shopping downtown (try the streets between Lexington Avenue and Broadway), with funky and unique boutiques. The local art scene is vibrant and thriving, be sure to check out a few galleries. For hops enthusiasts, the Brewery District is the perfect place to grab a beer. If your budget allows, a trip to the historic Biltmore Estate is always worth it. Round out your visit by watching the sunset over the mountains from the patio of the Omni Grove Park Inn. Charleston is known as one of the most picturesque cities in the South, and for good reason. You can spend an entire weekend wandering around and admiring the architecture. For a weekend trip, the museums and historical plantation homes of Charleston are a must-see. Take a walk by the battery to watch the waves, then head into town for shopping. History enthusiasts can take a boat trip to Fort Sumter, or wander the old markets. Charleston’s seafood offerings are top notch, whether you’re in the mood for fine dining or fried shrimp from a shack off the highway. It’s a little further away (nearly a four-hour drive), but it’s worth the trip. Affectionately called ‘The Silicon Valley of the South,’ downtown Greenville is just 45 minutes away from Clemson and boasts some of the best restaurants and shops in the area. Walk over the suspension bridge at Falls Park for a perfect photo op. If you’re in the mood to see a show, check out Peace Centre. Feeling athletic? Try a hike down the Swamp Rabbit Trail. Then reward yourself with pizza and beer at the Swamp Rabbit Brewery (maybe even a crepe or two at Tandem Creperie). Finish the weekend with a scavenger hunt—try to find all the mice on Main Street! The Queen City is a little further off the beaten path, but it’s the perfect place for a weekend getaway. Football enthusiasts can try to nab tickets to a Carolina Panthers game. For the culture vultures, Charlotte is the ideal destination. Check out the Levine Center for the Arts, or try a Gallery Crawl in the south end of the city. For shopper and bargain hunters, it doesn’t get better than Concord Mills, which offers everything from large chain stores to small boutiques, there’s even a Bass Pro Shop! 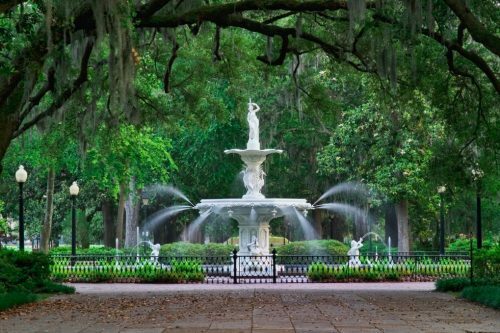 Savannah is known as ‘The Hostess City’ for serving up plenty of southern charm. There are tons of restaurants that serve a range of affordable fare, as well as upscale establishments offering new takes on classic southern dishes. Try Fire Street Food for reasonably priced delicacies, and The Grey if you’re looking for something more upscale. For the history buffs, the Mercer Williams House Museum is a must-see—it was featured in the movie Midnight in the Garden of Good and Evil. The Savannah College of Art and Design provides endless boutique galleries and shops, all around the city. Ready for an adventure away from EPOCH Clemson? Hop in the car and hit any of these weekend destinations for a quick getaway!